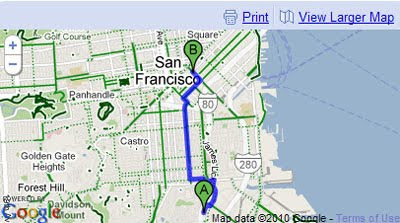 Biking Directions have been added to the Google Maps API v3. The BicyclingLayer class allows map developers to add information about bike trails, lanes and recommended roads for bicyling onto a Google Map. Globe Bikes is already taking advantage of this addition to the API by placing a simple biking directions gadget on their website. The biking directions gadget can easily be added to any website to give users the ability to find biking routes to any set location. Biking directions are also now available on mobile. Android phone owners can now plan out a biking route directly from their phones. In addition to getting customized routes, you can also turn on the Bicycling layer to see dedicated bike-only trails (dark green), roads with bike lanes (light green), or roads that are good for biking but lack a dedicated lane (dashed green).